Even my best sculpted leaves are relatively stylized representations that wouldn’t be mistaken for the real deal. I think that they are lovely, and I’m happy with them, but then there are times when I attempt to recreate more complicated leaves. It rarely ends well. Now and then I’m happy with my oak leaves — and I can do a fine aspen, willow, elm, rose, lilac, or beech leaf — but I’ve never done a maple-from-scratch that I find satisfactory. That’s why, when an attendee at one of the markets this weekend mentioned leaf impressions, I was eager to try a new technique. I should warn you that the finished leaf is more fragile than most of my jewelry projects. If you make these to be worn, you might want to make them thicker, add a backing layer, or just handle with care. They look pretty spectacular, but they are easily broken. I am inclined to make them more as ornaments than as jewelry, just to avoid the disappointment of my clumsy self losing my balance and smashing it against a hard surface, as I ahem may or may not have done two days after making it. After having tried this once, I have some thoughts on how to make it go more smoothly. 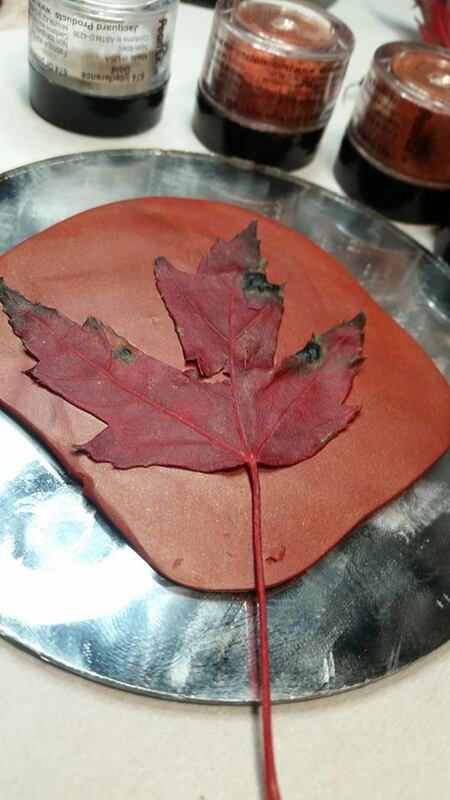 I’m also thinking about trying to make a thin mold for when the leaves are gone. The only adjustment that I would definitely advise, though, is to avoid pressing the stem into your clay. It’s likely to be thicker and firmer than the leaf, and you will want that part to have less indent, as it needs to hold the jump ring. In fact, you might want to go ahead and cut off the stem before you start. You can always make a slight indentation with a needle tool later if you want it. With that said, let’s begin! 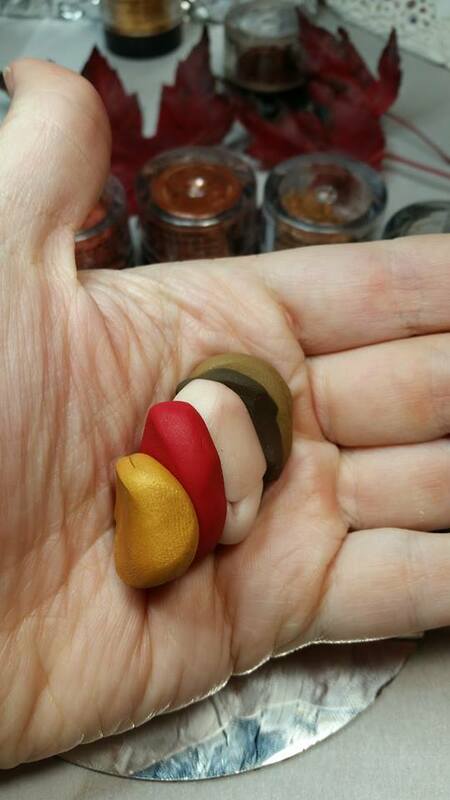 Choose your polymer clay color(s) and condition your clay. You may want to have a slight marbling or a skinner blend, or you may want your leaf slightly translucent. There are several color options. 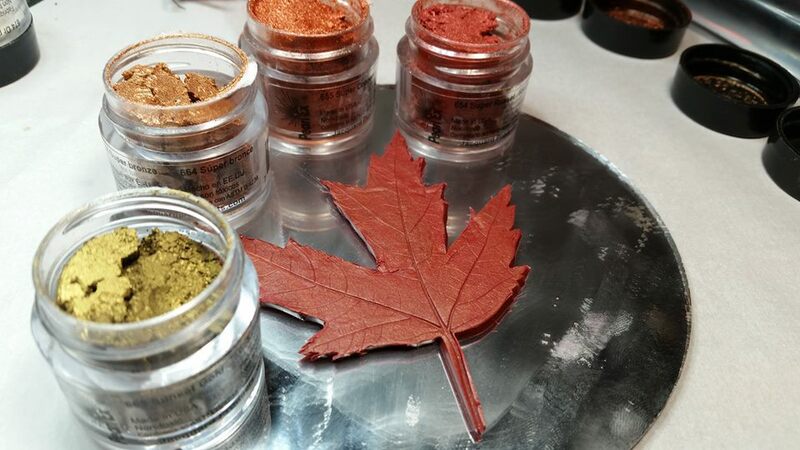 Remember to choose colors that are darker than the mica powders that you will be using. I chose to use a succession of colors from a greenish gold to a red bronze, topped with a light dusting of interference gold. Be sure to have safe work and baking surfaces prepared. 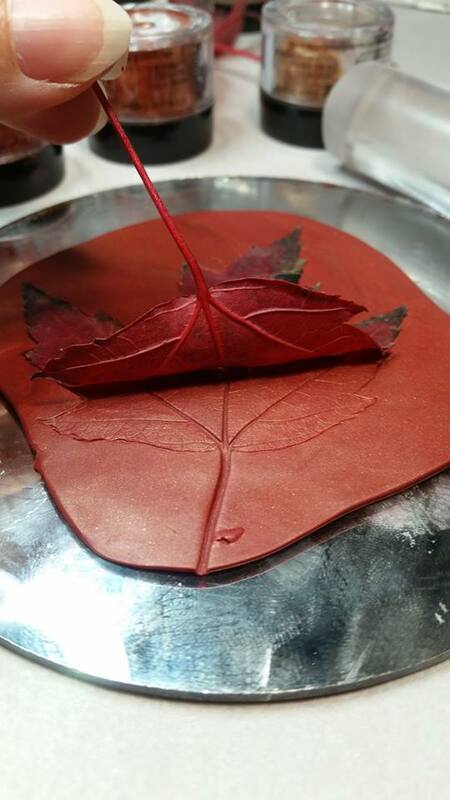 In addition, you will need as many clean, fresh, pliable leaves as you want finished clay leaves. 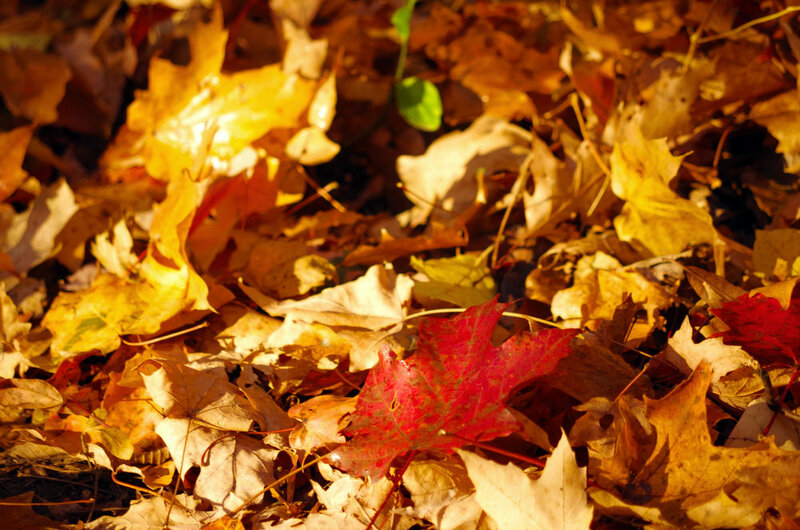 You may be able to re-use leaves, but you cannot count on them releasing cleanly in one piece. 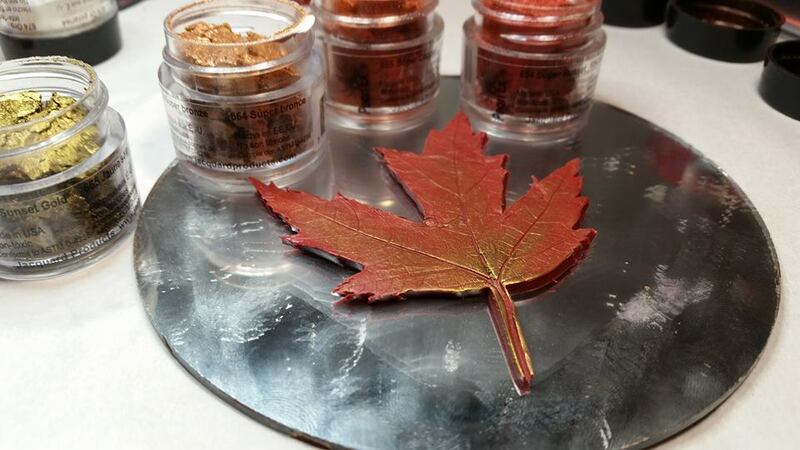 Any dry or brittle parts of the leaves may break off and embed themselves into the clay. 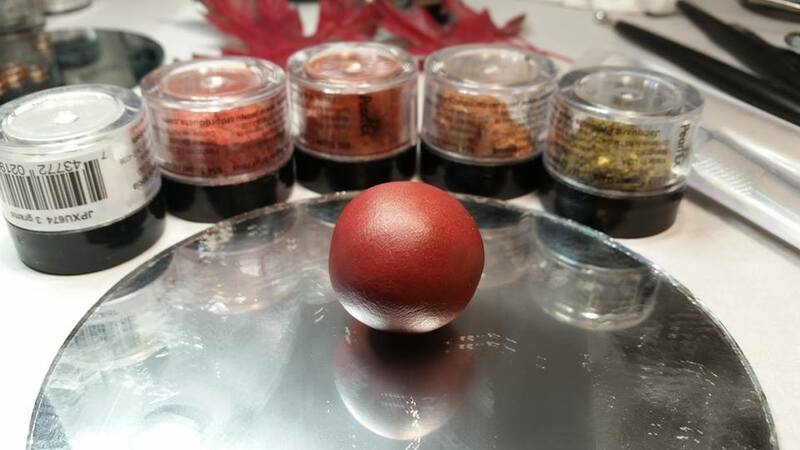 For this project you’ll need polymer clay with corresponding mica powders, fresh (flexible) leaves, surfaces safe for cutting and baking, a craft knife, a roller, a needle tool, a tissue blade, and findings. It also helps to have color inspiration. As I mentioned at the beginning, these are more fragile than the leaves that I normally make, and that is even with the fact that the edges aren’t as thin as I’d normally prefer. That said, I’m definitely making more, and I’m working on ways to make molds and improvements. I want to try some with translucent clay for use as window ornaments, and I also have visions of frosty, ethereal holly leaves for my Christmas tree. So many ideas! If you play around with this method, I’d love to see your creations. Feel free to send them in or post them on my Facebook page at SilverWheelArts!